We hear this often don’t we? What we typically do not do however is that which we know is right, which is to practice. 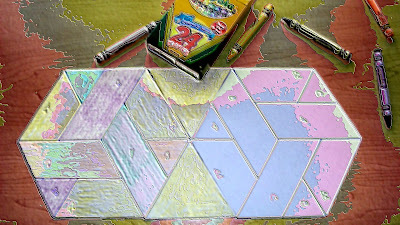 The above picture was me playing with hexie shapes joined by two triangles and coloring them in with crayons. I took a picture because the camera always give me a different perspective. 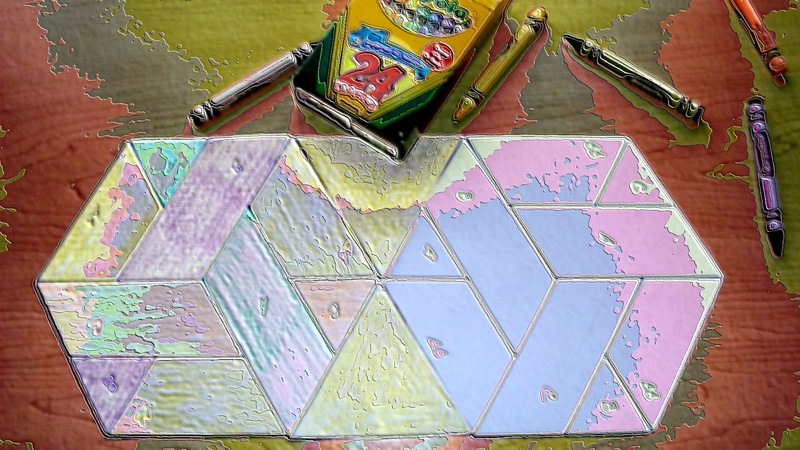 Then I got to playing in the software getting different effects and loved how the practice piece turned out. Practice is definitely a lifelong journey in itself. I have noticed that if I don’t participate in practicing, I quickly lose my edge. Things that previously came easily now have to be thought out or worse, redone merely because I have forgotten how to do it. And then I had a lightbulb moment while reading Romans Chapter 8 this morning. This enlightenment was definitely a gift from the Holy Spirit. I have been diligent (read “practicing”) in my Bible studies and must have been sensitive to receiving it. I wish I could say I’m always sensitive to hearing God’s leading, but I’m not. I'm definitely a WIP. :) There’s that practice thing again! But back to the moment I mentioned. Are you ready for it? Life is one big tournament of practice! The outcome of the tournament is a direct reflection of how well, how often, and how dutiful you are to practicing. Now I have to say right now in case you are new to my blog and don’t know me. I am a believer in Christ Jesus. I believe that God sent His son, Jesus who knew no sin to be sin for us, that we might become the righteousness of God in Him. We truly have an awesome God! The reason I state that I’m a believer of Jesus Christ is that all the work and practice I could do at anything in my entire lifetime would not be enough to enter into the one place I most definitely want to live eternity in…..Heaven. I first had to accept Jesus Christ as my Lord and Savior. After receiving His forgiveness, I was positioned properly to set up my lifelong practice mat. Do you have a place where you document the things you desire to be the best at? A few of mine are: (1) Being a Godly woman (this is truly a daily, moment by moment, continual practice), (2) Appreciate and honor the joy of being a wife to the person that I truly love and adore with all my heart and to bring joy and love to my husband and peace and beauty to our home, (3) be proficient at cooking delicious, homemade, healthy meals for my family, (4) excel at being a business owner of an embroidery shop and quilting teacher, and (5) being a forgiving, honest person and friend. This list is a living, breathing list that adjusts as life is lived. Thank you if you have read this far. I appreciate your visit and would like you to invite you to join an adventure with me. Everyone loves an adventure, don’t they? I will be your tour guide during the adventure. We will visit lots of places (techniques) and we will take part in many sights and sounds (fabrics/sewing) and will savor the tastes (quilting) from each of the places we visit. You will be shown videos of particular places before we jump on the boat so that you have a basic knowledge of where you are going before you get there. No one will get lost because I am the tour guide and I’m very confident in my ability to guide you through our adventure. I will have practiced everything beforehand so that you can enjoy every moment knowing that you are in good and capable hands. Because this is an adventure that is available to anyone regardless of a person’s ability or knowledge base, the price of admission is set very low. So low in fact, that there is no reason that anyone would refuse. The cost for admission is two-fold: (1) that you become a follower of my blog, (2) post a comment below letting me know you would like to order your passport. Please include your email address in the post (many people cannot be responded to because your email is not shown). I can't send your passport if I don't know where to send it! Get your sunscreen ready -- We are nearly ready to board! Terry, you are signed up!